Vienna Re-visited – A PT Model for Auckland? 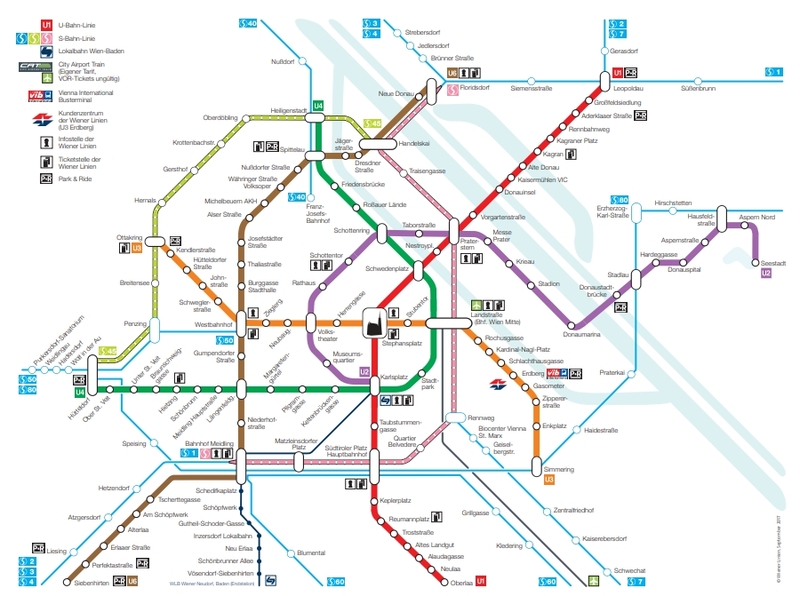 A couple of months ago Matt wrote of the extraordinary public transport system of Vienna. What Vienna has been able to achieve, and is continuing to achieve is so remarkable that, in my view, it deserves another look. While I have been lucky enough to experience the unique bus way of Curitiba, the smooth rubber wheeled trains of Santiago, and the bustling subways of Sao Paulo , Rio and London I have to admit that I have not been to Vienna. I first encountered talk of their transport system when we hosted a 16 year old home stay student. It seemed somewhat unusual that she spoke fondly of Vienna’s public transport as that is not the sort of thing important to most her age. Over the last six years we have hosted two couples from Vienna and they spoke with the same fondness of a system that it seems almost the entire city is so proud of. Earlier in the year our home stay student returned and she was just as animated about a system that provides all of her transport needs save when she travels out of Vienna. What makes public transport in Vienna so outstanding? The network is great, but I don’t want to talk of that here because it is the pricing scheme that appears to make it the outstanding success that it is. More of that later. Vienna is not dissimilar in size to Auckland. Ownership of the Vienna yearly PT pass at 730,000 has surpassed the ownership of private vehicles. In Vienna 92% of all trips are made using annual passes. (see the types of passes available below). I have lived on and off in Auckland for the last thirty years. A constant during that period has been increasing traffic congestion while the creation of new roads has also been a constant. Trying to build our way out of congestion by adding new roads has not worked. Here I discuss the approach of Vienna because it provides such a contrast to Auckland in the movement of its inhabitants, yet one that has been stunningly successful. A large part of the success of Vienna’s system has been the passes of different descriptions. As mentioned above 92% of trips are made using these passes and the cheap price is considered a huge part of this. Single ticket € 2.40 Valid for one journey within one zone. Half price ticket for children and dogs € 1.20 Valid for one journey within one zone. Senior citizens’ ticket € 1.50 Valid for one journey for senior citizens over the age of 62. €17.1 Valid for unlimited travel for one adult within Vienna. Valid 24, 48 or 72 hours from the time of validation. €24.9 Valid for unlimited travel for one adult and one child under 15 years within Vienna for 24, 48 or 72 hours, plus discounts or benefits at museums, sights, theatres, concerts, shops, restaurants and cafés. 8-day ticket € 40.80 Each strip on this ticket is valid for unlimited travel in Vienna for one person on the day of validation until 1:00am of the following day. Weekly travel pass € 17.10 Valid for unlimited travel in Vienna within the specified calendar week (Mon-Sun). This is not a 7-day ticket! Monthly travel pass € 51 Valid for unlimited travel in Vienna within the specified calendar month. Annual travel pass € 365 Valid for unlimited travel in Vienna within 12 calendar months. A passport picture is required, and the ticket must be ordered from the Vienna Transport head office. How Did Vienna Get to Where It Is? I have reproduced part of an abstract that outlines some of the progression of the public transport system in Vienna. It has been a long time arriving at where it is. For me, one of the major takeaways from the Vienna experience is what happened when they slashed the annual pass price in 2012. The significant decrease in the price did not majorly affect farebox recovery. Vienna, Austria reduced the car share of trips by a third between 1993 and 2014: from 40% to 27%. The key to Vienna’s success has been a coordinated package of mutually reinforcing transport and land-use policies that have made car use slower, less convenient, and more costly, while increasing the safety, convenience, and feasibility of walking, cycling, and public transport. During 32 in-person interviews in Vienna in May 2015, a wide range of 45 politicians, bureaucrats, transport planners, and academics almost unanimously identified the expansion of the metro (U-Bahn) network and parking management as the two most important policies accounting for the dramatic reduction in car mode share since 1993. Vienna has had a policy of charging low transit fares for many years, but these have recently been reduced further, making them even less expensive relative to most other major European cities. In 2012, Vienna reduced its price for an annual ticket for unlimited travel within the city boundaries from €449 to €365. Maria Vassilakou, the vice-mayor for transport (Green Party), was the principal advocate of the inexpensive annual ticket and initially proposed an even cheaper €100 annual ticket before having to compromise on €365 with the Social Democrats as part of their coalition negotiations in 2010. The renewed coalition negotiations after the 2015 elections also included an explicit agreement on continuing the €365 annual ticket. Since 2012, Vienna’s seniors have been able to purchase an annual ticket for €224. School students pay €60 per year, and university students €75 per semester (5 months). As a result of these large discounts, such passes of various kinds account for 92% of passenger trips, compared to only 6% with single trip tickets. The Vienna mode share of public transport rose three percentage points (36% to 39%) from 2011 to 2013, five times the annual rate of increase during the previous decade (2001-2011). In our May 2015 interview with Vassilakou, she emphasized that this jump in public transport use was due to the introduction of the €365 annual ticket. There was some opposition to these fare cuts, on fiscal grounds, from managers of the city’s public transport system until the city government pledged to cover any lost revenues. In fact, ridership grew so much that total fare revenue increased. But operating cost increased as well because of the additional services necessary to accommodate the increasing demand. As a result, the percentage of operating costs covered by fares fell from 60% in 2011 to 55% in 2015. The hallmark of the Vienna transport system is that, first and foremost, it seems to be designed to primarily act in the purpose for which it was intended; that is to move the maximum number of people that it can by public transport. I have been critical of some proposals for Auckland where people say, let our kids travel for free. The wider approach that Vienna has taken of cheap fares for everyone has resulted in ridership figures that most of us cannot comprehend – ten times the number of annual trips in Auckland. There have been other very significant benefits of the Vienna transport system the first of which is environmental. The city is on track for a mode share of 20% of trips by car by 2025. Again this is a number that most of us will struggle to comprehend. Remember the target for the inner city of Auckland is 27% by 2045 with little indication that we are on track. It is evident that with such low car use that this has significant impact on the physical environment of the city in terms of reducing pollution and making a safer environment for those in cars, on bikes or on foot. The transport operator’s research also shows that there are significantly better financial outcomes for individuals, couples and families who choose to use public transport as their predominant means of transport. See here for the comprehensive Mobility Plan that Vienna has. Would This Pricing Model Work in Auckland? The Vienna model relies on significant government support as does Auckland. There would have to be a will to lift that level of support although Vienna found the increased ridership meant significantly more revenue. It is quite clear that our current infrastructure could not cope with significant volume increases. It does seem though that AT needs to begin the process of reducing Auckland’s very expensive public transport prices now if it wants to achieve the goals that it has set for itself. The current PT growth rate of around 4% is not even keeping pace with the annual increase in trips by car. In simple terms Auckland is going backwards with increasing congestion, more fuel use and greater greenhouse emissions. There are downsides to a one zone fare system (and I am not advocating such a system that stretches to Warkworth in the north or Pukekohe in the south) but a pricing system that encourages development along the transport corridors is likely to encourage an efficient PT system while also ensuring that those who are not attracted to growth upwards retain some options. As I said at the start of this post I have seen a transport system in Auckland that has failed us; that seems to be continuing to fail us; and here is a time proven system that has been an outstanding success. Annual passes are a way to attract further growth when growth has slowed down recently. It would be great to see a $1,000 annual pass for adults for inner zone and $2,000 for the outer zone. Encouraging youth into PT is the way we can change this for the future. School Students: suggest a $1 flat fare for irrespective of distance ($400 a year) or a $250 annual pass. Tertiary Students: suggest a $2 flat fare irrespective of distance ($700 p.a.) or a $400 annual pass. It would be very interesting to see any modelling on fare pricing options AT or NZTA may have done. 365 Euro is 0.76% of Vienna GDP whereas $2,000 would be 3.26% of an Auckland GDP. Match Vienna and set the price to $475 and it would be really persuasive – get plenty of cars of the road. Don’t bother with zones. And $235 for children. Could somebody who knows Vienna please comment on the width of their roads compared with ours? If you start with very wide roads, perhaps as a result of wartime destruction, then light rail can be introduced without excessive delays to other vehicles. In Dominion Road, I cannot see it being anything other than a disaster for all road users and adjoining businesses. We need to see reallocation of road space as a positive. Have a look, or look again, at the Healthy Streets post. Sixty years of investing in roads and in inducing traffic has resulted in too much of the public space being given to the private car. We are sicker, fatter and dying earlier as a result. Reallocating this space to make walking and cycling pleasant again is important. Politically, the easiest time to do this must surely be when the people flow is also increased? Light rail and a connected network of bus lanes are changes that should be easy because of their superior people movement – and yes, plenty of people will ditch the car to make use of those improvements. But we have to do it even when people flow is not increased, for the sake of our health, children’s freedom to access their city, and for our environment. What we have now is not sustainable, and it’s not sacrosanct – it’s just the result of poor planning. We can change that. Nikelowe2013 – I was on holiday in Vienna in 2016 and what struck me was the width of the roads along which they have light rail. I was actually taken aback by how they did it along what would be thin roads by Auckland standards. Also the lack of car traffic made an impression on me. It didn’t dominate all public space as it seems to in Auckland, and this was reflected in how quiet our neighborhood was. There were plenty of people around, just not the constant barrage on the senses there is in Auckland from traffic noise. Thank you for that. So they run cars and light rail on the same space like a traditional tram. That is a bit different to the AT plan of using Dominion Road as part of a trunk system. and reliant on having low traffic volumes. It wouldn’t work in Dominion Rd until we’ve successfully changed on car mode share. Siebensterngasse is not really comparable to Dominion Road in context of connection and traffic. It is more of a Sanderingham Rd vs Dominion Rd. In this example Dominion Road would be Mariahifferstrabe. This has a Uban or underground. The location is quite close to the city core with high activity areas like Museumquartier. Plus the high density. Those streetviews are what Dominion Road should look like in 50 years. Note: I lived in Zieglergasse for a couple months. A visited a few times as my wife as a good friend who lives in that street. After the war we tended to build those cities up again, AFAIK usually with the same layout as before. And often in a similar style. Destruction for carving out big avenues happened as well, but earlier, in the 19th century. (Paris is a prominent example). You also often see wider spaces where the city walls used to stand. But in those medieval city centres streets tend to be narrow. One of the striking features of Auckland when coming from Europe is the absolutely huge size of the streets. You see small local streets where just the roadway is 11 or even 13 metres wide. In Europe you would often see 10 to 15 metres from wall to wall (which makes sense, pedestrians don’t need that much space to manoeuvre around. How those streets ended up this wide in Auckland I don’t know). Note the concession rates for children and dogs. Dogs? Surely you mean licensed certified service dogs, or canines in cages? No, just dogs. AT. bans them. If we could get around Auckland, I wouldn’t have bought the car k have and Ted wouldn’t have an Instagram account as tedtheuberdog. So thanks AT for that – most liveable cities let you take your companion creature, but not here. That has consequences as more workplaces become pet friendly. Woof! I’d certainly be a bigger user of PT if I could take my dog with me. Would it be so hard for AT to run a pilot program for a few weekends where dogs are allowed on trains? not everybody shares your enthusiasm for pets on public transport. Yes I agree. I would prefer not to share that confined a space with a dog. Look, I’d prefer not to travel with tall people or drunks, but I guess we all have our cross to bear. Welcome to the 1%. Yes. Except they are human beings and so are allowed on the bus. That is true. Which is why rules are needed. Just like with human passengers. At the end of the day, more and more people are choosing not to have children (my partner and I included) and our four legged charges fill the void that some feel without a dependent to care for. Are you suggesting that this increasing part of the population should be locked out of PT, when the system is clearly workable? If you wish to counter with concerns over allergies or phobias, I’ll preempt with the advice that not all dogs trigger allergies and there are other phobias that you may not think of – For example, I’m not very comfortable around people and in the past, when my coping strategies weren’t good, this has caused great anxiety. Which is kinda funny considering the careers I’ve had in the past and the hobbies I’ve indulged in. Regarding trains, what about the front (and/or rear) carriage being for those with pets? We provide for pets and their owners and those carriages can be shared by passengers who don’t care either way. For those that do, the rest of the train is theirs to enjoy. The Vienese are well known for their love of very small dogs and very long dogs (miniature dachshunds for instance). The sort of dog you can pick up and put in your handbag etc (and they do). No large dogs seen when i went to Vienna. Ah well, I tried to get kids travelling independently on public transport. I did it for their health and independence. But given we have more hospitalisations from dog attacks in Auckland each year than we have DSI from transport, I’ll change tack. We don’t have little Viennese apartment sized dogs. We have big dogs and we allowed all sorts of revolting breeds to be brought in. That’s it for me. My friends can continue driving their kids for all I care now. It’s probably better. Most of us have Viennese apartment-sized dogs. The test should be – if it can sit on your lap, and behave, it can travel. Blanket bans are just too dumb for a city with intelligent pretences. tedtheuberdog has an Uber rating of 4.96 stars out of 5 – close to a thousand 5 star ratings and countless comments in admiration. 10 people thought otherwise, and 2 asked for another car – easy. So if you’re in the 1% – people who can’t stand dogs – there’s always the back of the bus, or upstairs. But as we all know from the figures here, stats like that don’t lie. Bit of an assumption about Viennese dogs there.. A cursory glance through “Dogs of Vienna” on Facebook shows me huskies, Boxers, Dogue de Bordeaux, Pitbulls, labs, shepherds. As well as yes – chihuahuas, poodles and pugs. Maybe allowing dogs on PT can be part of the solution to better socialised dogs. You mean better socialised dog owners? Better socialised dog owners is perhaps the right way to put it. I don’t want to hear the phrase “Oh, he’s just playing” ever again. Are you playing the puppy victim card, @roeland? 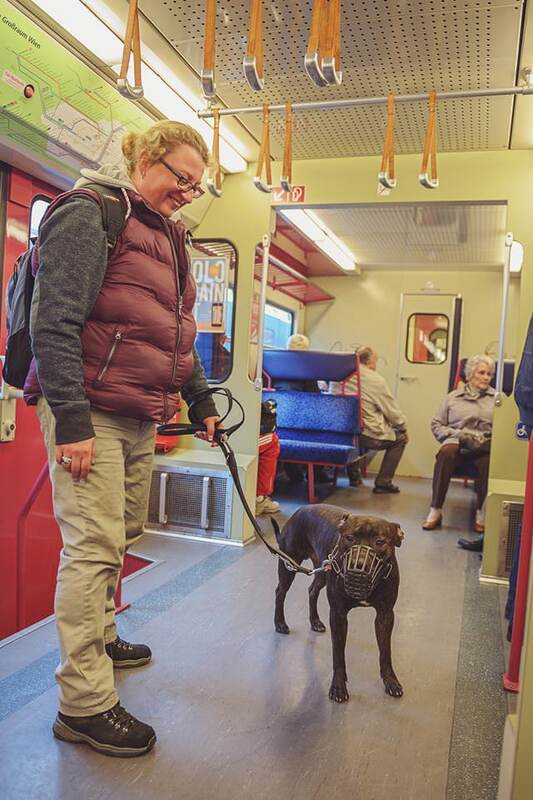 Looking at the rules for dogs on PT in Vienna ( https://www.wienerlinien.at/eportal3/ep/channelView.do/pageTypeId/66533/channelId/-2000635 ) All dogs must either be learned and muzzled (service animals need not be muzzled) or carried in an enclosed container. To my mind that is probably good enough insurance against badly behaved dogs, but it would need staff or cameras to make sure it’s enforced. If we wanted to go further a requirement to register your dog’s chip wouldn’t be unreasonable for uncaged dogs. I think muzzling a well-trained small dog is over the top – Ted’s a regular at Freida Margolis is Grey Lynn, along with other well-mannered small creatures. A lead, an ID chip on the tag, and an ability to issue an order to ban or restrain an unruly dog – surely that’s enough. Or does our safety culture now require children to be masked and muzzled, lest they swear and bite and swipe other passengers? Just in case? God, life is terrifying. Again, you are confusing animals with human beings. They are not the same thing. @goosoid Of course animals aren’t humans – otherwise, how could you bear to eat them? @ Luxated – I’d muzzle my Japanese Spitz if that’s the requirement to use PT. It’d look pretty overkill, but I’d do it. The muzzle would come off the moment we left the station/stop though. As a responsible dog owner, and someone who used to be afraid of dogs, I don’t think that a muzzle is too big an ask. @ goosoid – Why is it that you wouldn’t want to be in the same vehicle as a restrained and muzzled dog? Genuine question. Oh well, looks like I’m outvoted on jaw control. Ted can get about looking like Hannibal Lecter. First it’ll be dogs allowed on buses and trains. Then owners will want their dog sitting on the seat beside them. Sorry, but I don’t want to sit on a seat that has been occupied by a dog. I also have no desire to get a dose of fleas. @ Heidi – It’s not like you to be so binary (sorry, struggling to find the right word). Obviously there will be rules in place and penalties for non-compliance. Perhaps it would be a better use of your energies to accept that this change will happen eventually and seek to mould the change to suit your preferences – As we all should. Perhaps the suggestions of muzzled and capable of sitting in one’s lap are a good start. Gets rid of English Mastiffs, which are massive (>110KG) but incredibly friendly and calm. There is endless debate over dangerous breeds and if they even exist. There are certainly dangerous owners. I know a dog owner who’s dog is “twitchy” because of how they trained it. Breed irrelevant in this case. I’m no fan of dogs, but I’d struggle to have an issue if they were either muzzled or caged. Looks like Vienna charges for dogs as well, so if they have a specific hop card for the dog it would further help with traceability and accountability. I have a large very friendly dog, but I’m not putting all 55kg of her on public transport, there has to be a limit. Peter AT only bans pets on the buses in Auckland city ,as we here on Waiheke have no problems with the transporting of all animals on the buses . I have only seen 1 driver refuse a dog but he allowed 2 others on the same bus . There was 1 trip I was on and there was 3 dogs [various sizes] 2 cats and a parrot and nobody had any problems . The cats and parrot were in cages and the dogs were just on leashes . This post means nothing to me. Not true – it was important enough for you to comment. I saw them at Sweetwaters in 1982. Jesus I feel old now. Cheaper fares must be part of this. Annual passes could be. I’m beginning to see that equity arguments mean the political situation provides more rationale for a very wide area to have a flat rate than would exist in a more equitable society, too. I wouldn’t include lifestyle block areas, but I would include outer cheaper suburbs. Only the AKL city centre has a driving mode share of below 50%. Across the whole region it’s much higher, into the 90s at the fringes. Completing these networks and improving service levels will transform peoples lives by giving more people more real choice. So true, but there’s social education required too. When you’re forced into acting in a certain way (high car dependency), you tend to adopt a mindset that conforms to and reinforces those decisions. As well as providing the services and infrastructure, we also need to spend money promoting the same and highlighting where the services and infra are doing well elsewhere in the city – Make it a matter of pride (and/or competition with your peers) to use the new infra and services. Incongruity can also work well in such promotions. An obvious starting point in Auckland is reduced off-peak fares. We already have the capacity to handle that. A few thoughts here on Auckland versus Vienna. 1. The population of the two cities is much closer than indicated. Stats NZ 2017 projections in 2017 had Auckland’s population at 1,652,200. With growth of over 40,000 per year, Auckland has likely already hit 1,7 million people. Vienna’s population is 1.757 million (and has only just again reached the population level of the early 20th century). 2. Believe it or not, the Vienna public transport patronage figure quoted (954 million) is actually an undercount as it only counts services run by Wiener Linien and doesn’t include S-Bahn Wien (commuter rail) boardings within Vienna. 3. Wiener Linien is aiming to get to 1 billion boardings per year in 2020 or 40% of all trips in Vienna (currently at 39%). There is huge investment in service and infrastructure improvements to help achieve this. 4. Governance is destiny. Outside of Vienna city limits are very suburban areas in the states of Lower Austria and Burgenland. There, car commute mode share into Vienna is 66% with traffic from these areas pouring into Vienna on its major arterials. 5. Vienna got affordable housing right nearly a century ago in the 1920s and hasn’t looked back since. It never dismantled its tram network and built a U-Bahn network (subway) from 1978 that provides dense radial and cross-city connectivity. 6. At the end of the second world war, Auckland had 120 million public transport boardings per year (100 million of those on trams) in a city of 250,000 or 480 boardings per capita/ year, close to what Vienna achieves today. At that time, Auckland was Vienna (in public transport terms at least). Vienna stayed being Vienna but Auckland quickly became a very car-oriented city after the Second World War. Just a note: Vienna is at the centre of a metropolitan area of roughly 2.6m. The figure of 1.7m is the population within the “city limits”. Comparing the population of cities is fraught with hard to compare measurements which can lead to misunderstandings and misrepresentations. Yes, but the important point is what to do now after 60 years of heading in the wrong direction. It’s going to be more expensive to repair our mistakes, but a comparison with Vienna, which started at a similar place in many respects, is useful to show us the changes we need to get back on track. We too can have dense development over a wide area. The most expensive option will be not doing so, continuing with low density inner suburbs, and keeping people hooked on the expensive driving mode. Budapest and Zagreb are also very similar to Vienna. Here is a visual comparison. Museum Quarter vs Spaghetti Junction. With a density of rail and light rail sufficient to mean that this small area around spaghetti junction would have 4 metro lines and 4 light rail lines, we really would have great access, wouldn’t we? It’s one reason why I think Ponsonby/Grey Lynn/Herne Bay staying SHZ is pure whitewash entitlement. Quite like that idea – Spaghetti Junction as shared cycle/pedestrian/light rail space with escalators to K’ Rd and the station. And is there still a hole under Stuff/Countdown Williamson Ave? Drill through to Newton Gully? Or has that horse bolted? There’s also this related question of urban form. A while ago, resource consent was denied for a little cluster of 3-storey houses in Grey Lynn. That was about 3 km from the city centre. Another part of this discussion is the politics of Vienna. The continuity of SPD and the relative left orientation of Vienna city governance vs Austria outside Vienna being more conservative as a whole. Furthermore Austria is relatively low density outside the cities. Should also be noted that Vienna was the core of an Empire, which lead to it’s diversity. So you can not understand Vienna purely in the context of Austria. My wife could go on a lot more about this – she done a thesis on Vienna. What I really take home from this post is the transit map – it’s clear, simply from looking at the map that you can use the transit network to access a massive chunk of the city. The grid of transit lines is absolutely a public relations and comms asset. I think AT and the Government really need to commit to the Congestion-Free network in full, and begin using that transit map in a lot of comms. Familiarise people with idea that the network is accessible from nearly all of Auckland. How do the dogs pay? Via a yap on their smart phone. or smart card – Yapper ? It is a false economy try improve fare-box recovery rate by increasing fare. – introduce CBD parking management strategies to levy all long term parking (including private) at least until congestion tolling is in place. Metro systems are generally not known for their speed, I don’t see why Auckland should spend billions of dollars more on something that might be marginally faster than the proposed light rail network. To get the PT user benefits, the strategic PT network should be “rapid” otherwise why spend billions constructing something which provides no travel time advantage? To be rapid there would need to be express services, there are very few metros around the world that have these sorts of patterns, New York is the only one I can think of. It is pretty normal for metros to have an average speed of around 30kmh. I’m intrigued to know what makes the airport strategic, ahead of say the lines to Papakura or Swanson, both of which would move considerably more people. Yes in terms of density Auckland and Vienna are currently very different, but what will Auckland look like post light rail and decent bus services on dedicated bus lanes. Intensification is starting to happen in many areas with my own suburb seeing construction of four medium rise (5 – 9 stories) in a 500m radius with another one about to start. The answer for Auckland will not be it extending to Pukukohe or Warkworth, or in any direction. First, we simply won’t be able to afford the infrastructure e.g. the Superannuation Fund may build the planned light rail, but at what cost to the public? and greenhouse emission targets will not allow people to drive half way across Auckland whether they can afford it or not. Thanks Taka for this quality post. I think light rail everywhere is the way to go. We have such abundant, renewal electricity and many wide roads that can easily be repurposed all over the city. Take a look at Pakuranga Road, four lanes wide including a generour median strip. It’s an absolute no-brainer to allocate half of the road for light rail all the way to Howick, isn’t it? The savings in vehicle purchasing, maintenance and fuel alone would pay for much of it, and it’s the kind of investment we have to make if we are serious about CO2 and road safety. Another telling stat – Vienna had 20 traffic deaths last year compared with 64 for Auckland. We have to do better. Thanks for your comments. Yes there is indeed a huge benefit to society if less is invested by individuals in private cars and fuel. I take your point about the lesser number of deaths on Vienna streets and roads. It always surprises me when I hear engineers say that we should engineer our streets to make them safer. With my business and behavioural background, when I think of the same issue I imagine dissuading, persuading and inhibiting people from driving less fixing the problem at probably a tenth of the cost. My understanding was that the outsides of the road were concrete and the area with the tramlines was wooden blocks or pavers with asphalt over the top to enable track maintenance. These were tarmacced over when the rails were removed. From what I saw, the concrete outer sections stayed in good repair in most places despite being over 40 years old until they were ripped out and replaced with tarmac. They now need to be resurfaced every few years. Coincidentally this occurred just after road repairs began to be contracted out. Many other perfectly serviceable concrete roads where trams did not run were also removed at the same time. The other thing is that Vienna is well integrated into the long-distance rail network. I’ve been to Vienna a few times, and it is so easy to arrive via train and already be at the centre of the city. From there I typically just walk. Sometimes a tram ride. But the system is set up so that you do not have to have a car, or even encounter a car. Yes, I would have only been training in from another European city, but by comparison with Auckland, most people arriving in Auckland fly in – both from overseas or from another NZ city – and already the non-public transport mode kicks in. Taxis, rental cars, friends picking them up in private cars etc – and one bus, squeezing its way through the traffic lanes of massed taxis at the airport. I take the bus every time, but the Auckland experience is set up to fail you from the get-go. Vienna – arrive at Haupbahnhoff, get off and walk – you’re already at the centre of things. Plus: the architecture of Vienna is soooooo much better….. obligatory trips to the Dom, the Hans Hollein jewellery shop, the Adolf Loos post office, the workers housing, the Hundertwasser haus, and so much more. Hard not to love Vienna. The Piccadilly Line Metro Service through London out to Heathrow is an incredibly useful service but fast it is not. For whom? If you mean airport travelers, they have an alternative line, no? It’s not a fast service for anyone, I’ve never used to to get to and from Heathrow since the Heathrow Express was built; there are three rail options to Heathrow, two of them are very good the other one is the Piccadilly Line. I did actually use the Piccadilly line to get to/from Heathrow a few times back when I lived in London instead of Heathrow connect or the Heathrow express. Totally agree – keep it simple, everyone gets a turn. Short cycles encourage tailgating and red running on filters. Just let each direction have its chance and everything gets smoother. We’ve overcomplicated intersections and the phases are incomprehensible. Note that there is no free travel for pensioners in Vienna. I’m guessing they don’t have a Winston Peters. There are a few holes in the comparison, you’ve used the population of greater Auckland but only the urban population of Vienna, Vienna’s metro population is 2.6m nearly twice Auckland’s, which is a better metric to use when comparing cities. Vienna has had trams, metro and heavy rail for many generations. They also have a a proper heavy rail line to the airport,the airport is also connected to the S-bahn network, and the intercity trains, they didn’t decide to build a light rail line to the airport then try justy building underdone infrastructure by saying it’s not an airport line, like the dog we have been sold.